As you may have noticed from my previous Hunger Games guest post, I am deeply interested in the connections between Suzanne Collins’s fiction and the very real history and culture of Appalachia, where I live, work, and teach Appalachian culture. My husband’s mother was born in a coal mining town, and her mother has graced us with wonderful oral history material regarding life in the coal towns. As the families of 29 Montcoal, WV, families mourn their loved ones lost in the mine explosion last Monday (the remaining four miners’ bodies were found over the weekend), Hunger Games readers might be thinking of Katniss Everdeen, whose father, along with her friend Gale’s father, was killed in an coal mining accident when Katniss was 11. In honor of those very real individuals and their families, it might be appropriate to look at a few of the ways in which Suzanne Collins’ fictional District 12 and its coal mining culture mirror the actual history and culture in the coal-mining regions of Appalachia. Although this is a rather lengthy post, be assured that, pardon the pun, it only scratches the surface. Katniss states that District 12 is what used to be Appalachia, but, in many ways, it is still very much Appalachia. 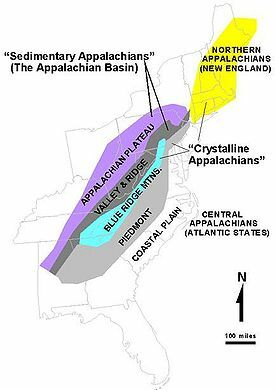 Of course, the Appalachian mountains are a vast region, running from the Deep South all the way up to Nova Scotia before falling off into the ocean, and Katniss does not specify (yet) which part of that area is District 12. However, since coal is primarily mined in two of the four major regions of Southern Appalachia —the Ridge and Valley section and the Cumberland Plateau—District 12 is likely in one of those areas. The weather, plant life, and food practices make Eastern Kentucky or southwest VA or WV likely candidates, as do many of the connections with these areas. District 12 is remarkably like the coal mining towns once found scattered across the Appalachian region. These towns were built to house the miners and their families and were owned by the coal companies, so that everything in the town actually belonged to the company: homes, schools, even churches. Miners had the payment for their houses, furniture, medical care, and store credit taken out of their paychecks, which were seldom enough to cover any other expense the family had, much less enough to allow the miners or their families to save enough to leave the mines. Countless miners began working in the mines to earn enough to relocate, but the economic conditions of mining prohibited financial mobility, especially in coal towns where the miners were not even paid in regular currency, but in “scrip,” money produced by the company and good only in company-owned stores. If the miner died, his family usually lost their home, just as Katniss’s mother and Prim will lose the fine house in the Victor’s Village if Katniss dies. The ways in which District 12 miners’ lives are controlled would have seemed familiar to early twentieth-century Appalachian miners. The owners of the coal companies that so rigidly controlled the lives of their miners were seldom from Appalachia, and, in fact, were frequently located in large metropolitan cities or even foreign countries. They rarely interacted with those who mined the coal for their companies, just as the Capitol denizens who control the fate of District 12’s residents are distanced from ever actually having to see what is happening there. Even the District 12 tributes are cleaned up when they enter the Capitol so that they don’t offend the refined sensibilities of those who will watch them fight and die. While conditions are far better today in coal mining communities, Katniss’s District 12 strongly resembles an early twentieth-century coal town, where malnutrition and disease were common, and miners worked long and difficult hours. In addition, the limited travel afforded by the railroad in District 12 reflects the similar limited transportation options in many coal-mining areas. The railroads were brought in primarily for the transportation of the coal, but they also provided mobility for residents in areas where there were seldom any good roads or other means of speedy transportation. However, the railroads were owned by the company, and they left when the coal was tapped out and the company shut down the mine. In the historical mining towns, as in District 12, there was also the simmer of rebellion under the surface. Miners fought, often violently, for the right to unionize and thus be able to demand better housing, hours, and pay. These struggles, many of them against a government which sided with the coal companies, lasted well into the late twentieth-century in some communities, and historical miners often suffered the same punishments as the District 12 rebels: lack of work, food shortages, physical punishment, and humiliation in the guise of justice. Thus, the grumbling miners on Gale’s team are following in a long tradition of revolution in the mines. The explosion that leaves both Gale and Katniss fatherless is also a close parallel with the historic dangers of coal mining. According to the Mine Safety and Health Administration, the deadliest year for mining in the US was 1907, in which 3,242 miners lost their lives, including 358 in the worst mine disaster in American history. In addition to explosions, miners faced the threat of being crushed, suffocated, or burned alive in mining accidents or suffering both the short- and long-term effects of exposure to coal dust or the toxic gases that Katniss thinks of when Wiress become her “mine canary” in Catching Fire. For those injured in mining accidents, medical care was limited. Company doctors and hospitals could be expensive, just as they are in District 12, and thus many historical miners sought traditional cures, just as Katniss’ mother uses herbal remedies to treat the injured and sick. Many coal miners were descended from the mountains’ original settlers, and thus could rely upon a tradition of herb lore. The family herb book Mrs. Everdeen consults undoubtedly contains plants used by Appalachian people in the late nineteenth and early twentieth century to supplement or replace the expensive medical care from the company doctor. Food was also collected using the same strategies employed by Gale and Katniss. The greens, berries, small game, wild turkeys, fish, and occasional deer (though whitetail deer were nearly hunted out of the area in the early twentieth century) that supplement the Hawthorne and Everdeen tables were also collected by the miners and their families who were adventurous and competent enough to acquire them. In order to supplement their incomes and to provide a needed ingredient for homemade remedies, coal miners sometimes moonlighted as moonshiners. Like Ripper, the disabled miner who has changed careers to become an “unlicensed distiller ,” Appalachian people, including miners, sometimes produced illegal (because they did not pay taxes to the government) white liquor that brought in needed cash and allowed them to continue family distilling traditions. Of course, the conditions in the coal towns, like those in District 12, were typical of those that foster alcoholism even for individuals who lack Haymitch’s particular demons. Despite the horrible conditions in mining communities, or perhaps because of them, both these towns and District 12 suffer from widely accepted stereotypes. The stereotypes of District 12 vary little from those slapped onto Appalachian people in the past and even today. The people of District 12 are regarded as stupid, backward, and hopeless, so much so that their tributes are seldom considered contenders in the annual Hunger Games, just so much cannon fodder for the bloodlust of Capitol viewers. Yet, especially as Katniss and Peeta rise through the ranks of their fellow tributes, they become popular, adored. The viewers in the Capitol want their District 12 tributes to fulfill their preconceived notions: drunk, surly, and socially hopeless misanthropes like Haymitch, or adorably backward and unaffected bumpkins. Similarly, the mainstream media, from early photographers to today’s documentary filmmakers, often seek those images of Appalachia that confirm their stereotypes and notions of “true” Appalachia. Like the stylists who put the poor District 12 tributes in skimpy coal miner outfits every year, the media generally tries to put mountain people into one end or the other of a spectrum of stereotypes. On the positive end, there is the image of the thrifty, wholesome, clean-living mountain person who is often musical or artistic and has an uncanny connection with nature. At the other end of the spectrum is the filthy, drunken, violent brute who makes up in meanness what he lacks in education. While there are certainly a few individuals who fall into these exaggerated descriptions, applying these stereotypes, which are both degrading, to everyone in a region negates the individuality and diversity of people in both the past and present Appalachia/District 12. It is not clear if Suzanne Collins has ever spent much time in Appalachia, much less tramping around the coal towns, many of which are gone now; once the coal had been extracted, the companies left, shutting down the town, but allowing individuals to stay if they wanted to buy their homes and live there without any form of employment. There is certainly no mention of living in Appalachia in Collins’s official biography, and it is unlikely that her father’s military career would have transferred the family to coal country. However, she very deftly captures many of the hardships experienced by historical coal miners(and sometimes contemporary ones, as we’ve all seen very clearly in the past week) as she shows that no matter how much the larger world has changed, in Panem, the lives of coal miners and their treatment by mainstream culture are no more evolved than the Capitol citizens, who like ancient Romans, seek entertainment from the spectacle of their enemies’ violent deaths. Elizabeth, this is an outstanding essay and it wonderfully fills in background on District 12. Thank you for sharing this with us. (Hum Sixteen Tons by Tennesse Ernie Ford.) I’ve read about the mining culture before and it was a horrible life, slavery, really. Lives were painful and short, as miners coughed themselves to death with the black lung. It pained me a lot to see Gale go into the mines. From what I’ve understood (through reading), Appalachian people have a hardy dignity that is soiled by the sterotypes about them. I wouldn’t be surprised if many in D 12 were both proud of Katniss for winning the Games and yet resentful of her new wealthy work-free status, even though she generously shared. It’s me, Arabella, still pretending to be John. As you might have guessed, I’m very passionate about “my people” (any flatlanders in my family tree were quickly hushed up). Thank you for your kind words. Notice how Katniss still eats at Greasy Sae’s, still hunts, even though she is now indedpendently wealthy. She is, as we say, not getting above her raisin’, an attempt to retain her relationships despite her change in status. I rather intentionally left out 16 tons, as it;s the song I hum as the final research papers start to bury me, but, strangely enough, I was emceeing a storytelling festival by a train track, and right during that song, a coal train came through. We couldn’t have planned it! You may also want to check out this NY Times Op-ed piece by Denise Giardina, an amazing Appalachian author. Elizabeth, where do you think the other 12 districts might be located? Thanks, Elizabeth, for the link; the column was moving. I tend to forget because my dad didn’t speak of it, but his mother’s family came from W. Virginia. I learned of this only just before he died and told me, when I said I loved bluegrass, that he hated “hillbilly” music; he’d heard enough of it. I wish I could have asked him some questions. His dad was of Scots ancestry. So I come honestly by my love of musical fifths! I think 11 was in the South and suspect 4 (Finnick) was in the Gulf. Perhaps the industrial one (8?) was in the Rust Belt? And Nuts and Bolts from Silicon Valley or the Puget Sound? Great peice, thank you so much for sharing. Out of curiosity, is it actually the case that many buildings and streets are visibly infused with coal dust? Collins makes a point of mentioning that on many occasions, and I was unclear as to whether she was making a metaphorical or literal (or both?) point regarding the integral nature of coal in the region? If the point was metaphorical (i.e., one does not typically see coal dust in building walls/floors and on thoroughfares), could this point to some non-natural explosion in the past (possibly a retaliatory effort by the Capitol)? Coal dust is everywhere in a coal town. My husband’s grandmother talks about how many times a day they had to sweep the house, and how their flowers were always gray. Even at my grandmother’s house, down the road from a coal processing plant, and many miles from the mines, coal dust was on everything. Obviously, this really contributed to the health problems of everyone, not just the miners. Since many of the safety and environmental regulations we have today are obviously discarded in District 12 to reach coal seams far deeper than those mined today, it’s likely that the impact on the area is far more severe than in contemporary mining towns. The Capitol doesn’t have to do anything overt to punish the District 12 folks; their jobs and living conditions are punitive. Please forgive me if I’m repeating something that has already been noted. I am still reading Hunger Games and don’t want to spoil any of the plot, so I’ve just skimmed the post above as well as the comments (they’re definitely worth a more careful read once I’ve finished the books). I just a have a note on Appalachian ancestry to add. The physical desciption of the mining families in Hunger Games- olive skin, straight black hair, gray eyes- struck me as interesting and appropriate. My husband’s family is from Appalachia, and they, along with many families in Appalachia today, share this Mediterranean-type coloring. They attribute their complexion their Melungeon ancestry (some consider this term pejorative, but my Appalachian in-laws don’t). This ethnicity is very mysterious; no one can agree on the origin, though it is almost certainly a mixed race. Some have said that, indeed, it is Mediterranean or North African; some attribute it to marriages between Anglos and slaves or between Anglos and Native Americans. But, the fact remains, a lot of Appalachians share this olive skin tone, dark hair, and grayish eyes, despite names that would indicate a Scotch-Irish ancestry (such as Collins . . .hmmm). If Collins isn’t from Appalachia, she sure did her research. And the coal companies imported workers, particularly Eastern Europeans and Italians as exploitable labor. These folks often married and stayed in the area. My husband’s great-grandmother married an Italian man (Granny says her step-daddy was “High-talian”). Denise Giardina, who wrote that lovely editorial, has the name and the look to testify to this sort of ancestry! The melungeon story is fascinating and mysterious, but the more recent ethnic diversification is quite well documented. Thank you all for sharing this wonderful information! My grandfather was a Pennsylvanian coal miner & from either Poland or Russia–we aren’t sure & there’s no one left to ask. My mom said no one really talked about where they immigrated from. His family moved to Illinois where he married my grandmother, an Italian woman (of course!). Because they both died when I was very young, I never had the opportunity to ask them about their childhoods. Reading this article really made me feel like I was learning more about my grandfather’s past, and I truly appreciate that. My students & I have worked a few maps of Panem as we’ve read the books and one thing we were curious about is how cold winters are in West Virginia. Because of my knowledge of my grandfather’s work in the mines, I pictured District 12 further north in Pennsylvania, perhaps. In Catching Fire, it is pretty cold in the fall (before the harvest), and they have a major blizzard. Does WV have winters like this? Thanks, Tracee! Obviously, this is an area that sparks my passion! Where I live now, in Western NC, we just had a winter that has gotten polar bears calling our local realtors! We had a huge snow on December 18, and that same snow was on the ground in places(under ice, fallen trees, and more snow) until March 18. Of course, I’m in the Blue Ridge where, thankfully, there is no coal, but Eastern Kentucky and SW VA got much the same winter, and I kind of suspect that Katniss lives there (more hills and hollows than the sharp peaks and drops of WVA). Actually, I found the descriptions of the weather perfect for the coal country I know. Great map! My speculations above were in line with it, except for Silicon Valley and Puget Sound (I forgot about the loss of the coastlines), now moved “inland.” I never pictured the Capitol as being on a coast; what indicates this in the text? Elizabeth, is that a photo of you? Very lovely. “In school, they tell us the Capitol was built in a place once called the Rockies. District 12 was in a region known as Appalachia” (p. 41, Hunger Games). The preceding paragraph talks about the train going 250 miles an hour and the journey to the Capitol (from District 12) taking less than a day. Someone with better math and geography skills could probably do more with that information than I.
I agree–district 12 is too big and district 11 not quite big enough. (It was the largest or at least much, much bigger than 12.) I also thought the Capitol was “ringed” by the districts, so we placed it where she has #1. Actually, I think most of them are too large (and they wouldn’t be up against each other) but I think the area they are located makes sense. #3 more in Silicon Valley, definitely. #7 more in Washington/Oregon, #10 more in Nebraska/Iowa, and we thought #1 could be in Canada where there are diamond mines, perhaps. I think #4 by the Gulf makes perfect sense and #13 further East does, as well. If you look at a map of our current nuclear plants, there are more clusters of them in East than anywhere else. I love looking at different theories and maps and this is one I hadn’t seen yet. Thanks for sharing! Deviant art also has some wonderful artwork by students relating to the books. Thanks for sharing about the weather, Elizabeth. That helps & makes perfect sense! It does take less than 24 hours to get to the Capitol (they travel late afternoon from #12 to the Capitol in THG and leave Capitol at 1 a.m. to head to #12 in CF). Of course, there are stops for fuel, which would have to be figured in, as well. But trying to do the math brings back bad memories of story problems (which gives the word “story” a BAD name, in my opinion), so I avoid any math, if possible. Anyone else want to attempt it? I, too, had imagined the Capitol as being a bit more centrally located and placed more squarely in the Rockies. It seems like the coastal placement is too far from #12 to make it in a day, even going 250 mph, but I didn’t attempt any calculations. Besides, “less than a day” is rather vague. Ah, yes, the Rockies; thanks for the quote, it immediately jogged my memory as to why the coast didn’t make sense. I visualized the districts as being sort of rayed out from the capitol, rather than a patchwork, though that may not make sense. I rather think of the Capitol as being more central as well, at least one district “behind ” it. Perhaps Collins will grace us with an official map with Mockingjay. But then, it would also be nice if she had a contest to see who gets it right! I’m eager to hear more about the other districts, too. I think it’s funny that Stephen King has his good guys holed up in the Rockies in the Stand (the bad guys are in Las Vegas). Yep, that’s me, Arabella (gray eyes, dark straight hair, and all!)! I owe everything to my photographer husband! So perhaps Suzanne Collins is drawing on her own family background. Do they mention that the most famous Melungeon ever is Elvis? Has that “Seam look” about him, doesn’t he? Actually, kittysue, “Melungeon” means “blended” like “melange”; this group has several diverse ethnic elements, which likely include among them African, Portuguese, and Native American threads. If you would like to research the topic, there are several excellent books, ranging from scholarly studies to personal narratives, and Mercer University has a Melungeon series of books. Just check amazon to see the nice variety of texts available. Although individuals who were of African heritage sometimes claimed they were Melungeon to improve the way they were perceived ( I have a wonderful story of a couple of Confederate soldiers of color who sometimes called themselves Melungeon), the folks who are likely Gale’s ancestors were probably some of the millions of Italian mine workers imported by the coal companies in the early twentieth century, sometimes as strikebreakers. While many African Americans migrated from Appalachia to other areas of the country, the Italian folks were more likely to stay, to become the ancestors of folks like the amazing Denise Giardina (and, incidentally, I’m not sure anyone involved in this conversation is actually Melungeon, so perhaps you should reserve your venom for a more appropriate venue. We do practice courtesy here, and we’ve moved on from this discussion quite some time ago). Here is a belated addition to the discussion of coal dust above. I was on a field trip looking at a mountaintop removal site on the border of KY and western VA last month. The one fact that stuck in my mind this time was hearing (from a scientist who lives right there) that the coal trucks driving down the country roads today leave coal dust that seeps into houses and harms families. Coal companies are given permits to use incredibly massive machines and complex technology to tear off the tops of mountains and destroy waterways to take coal, but even now they don’t use technology to keep the dust out of the air while coal is transported. This reality makes Collins’ images haunting for me.